Post US President Donald Trump called Prime Minister Narendra Modi on August 15, 2017, congratulating him on India’s 71st Independence Day, the White House announced that India and US will start a new 2-by-2 ministerial dialogue to enhance “peace and stability across the Indo-Pacific region, saying, “The leaders resolved to enhance peace and stability across the Indo-Pacific region by establishing a new 2-by-2 ministerial dialogue that will elevate their strategic consultations.” The dialogue participants were to be the Ministers of External Affairs, and Defence from India, with their US counterparts. In January 2018 media reported that the 2-by-2 ministerial dialogue is likely to begin in April. EAM Sushma Swaraj and Defence Minister Nirmala Sitharaman will travel to the US to hold dialogue with US Secretary of State Rex Tillerson and Defence Secretary James Mattis on April 18 or April 19. News reports, partly quoting US and Indian official sources, indicate agenda for the April dialogue will likely include: Pakistan, including ramifications of UN designated global terrorist Hafiz Saeed’s entry into Pakistani politics; Afghanistan � including China’s long-term interest in Afghanistan in conjunction Pakistan; alternative to China’s One Belt One Road; arms purchases � India wants “full defence package”, not piecemeal, while Pentagon favours step-by-step weaponization; India to insist US blocks balance $255 million military aid to Pakistan; Chinese naval build-up in Indo-Pacific, particularly in South China Sea, and; instability in West Asia and counter Islamic State strategy in vulnerable states like Afghanistan, Bangladesh and Maldives. Obviously, agenda for such dialogues cannot be disclosed completely with some issues classified. Hopefully, that will be applicable to this first dialogue too. For example, discussing Chinese support to Pakistani terrorism against India and J&K in particular is as important, if not more, than Hafiz Saeed’s entry into politics. US military aid to Pakistan must also be linked to closure of anti-India terrorist camps in POK and Pakistan, not just sanctuaries of Taliban and Haqqanis. Next, China’s state-sponsored media has been threatening China can enter J&K on Pakistan’s request, destabilize and separate India’s northeast, and create instability in Sikkim. 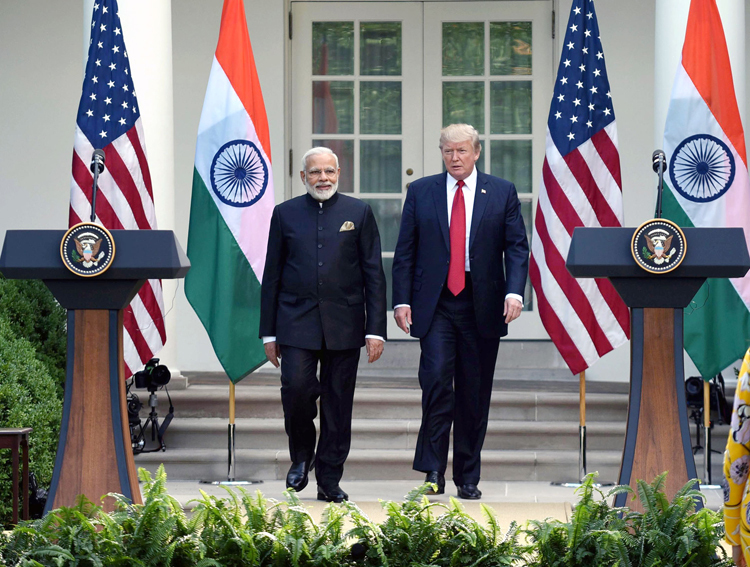 While US supports the ‘One China’ policy, US could confirm support to ‘One India’, if the US accords high priority to the Indo-US Strategic Partnership. This will address China’s illegal claims to Indian Territory including Arunachal Pradesh, as well as Pakistan’s illegal claim to J&K, the UN Resolution on Kashmir having already acknowledged accession of original State of J&K to India. Myanmar too must figure in the agenda, with China lethally arming the United Wa State Army in Myanmar, establishing United Liberation Front of West, South and East Asia, faking support to Myanmar government against Rohingyas and simultaneously supporting the Arakan Rohingya Salvation Army through Pakistan’s ISI and the LeT. US sources signal slight improvement in Afghanistan violence during 2017 over the previous year, but the recent UN Assistance Mission in Afghanistan (UNAMA) report released a month later documents 10, 453 civilian casualties alone in Afghanistan during 2017. The violence has gone up even more in 2018 with Taliban controlling 66 per cent of Afghan territory and threatening 70 per cent Afghanistan. The Great Game now has China-Pakistan-Russia-Iran aligned against US-NATO in Afghanistan. In terms of armaments, China offered its latest CH-3 UCAV to Pakistan in 2015 and Pakistan is already operating China’s armed multi-role Wing Loong-1 drone. Russia has recently agreed to establish the Pakistan-Russia Military Commission for Military Cooperation amid tensions with a US. There is no reason Russia may not provide Pakistan with its latest weapon systems including helicopters and aircraft, given the developing geopolitical environment and if Russia feels India leaning too much on the US. In this backdrop, the US approach of assisting Indian military modernization through “step-by-step approach” is ludicrous and doesn’t inspire confidence. US recently warned Iraq, “amongst number of other countries”, consequences of extending military cooperation with Russia, and striking deals to purchase advanced weaponry (particularly S-400 SAMs) due to the Countering America’s Adversaries Through Sanctions Act (CAATSA). Does this warning include India because if it does, it is blackmail? Is this reason for the ‘go slow’ campaign in the Indo-Russian FGFA? If we are to cancel the S-400 deal under pressure, the long-term geostrategic consequences of putting all the eggs in one basket must be taken into account. Finally, US and China are developing space weapons and war is predicted between both countries. But then 21st century conflicts are dominated by irregular conflicts. In this context the numerous fault-lines of China and Pakistan must find place in the dialogue. Above issues need to be taken into account by policy makers if the Indo-US strategic partnership is to be optimized for benefiting both countries.